In conferring the Awards, the President was assisted by DOLE Secretary Silvestro Bello III, DSWD Secretary Rolando Bautista, CFO Secretary and Chairperson Justice Francisco “Nick” Acosta, and OWWA Administrator Hans Leo Cacdac. The recipients of the 2018 PAFIOO have been selected from a total of 96 nominations received by the Commission on Filipinos Overseas from 28 countries through 37 Philippine embassies and consulates. The CFO is led by Secretary Acosta who said in his welcome message “The Filipino nation honors you not only for your wide ranging achievements but more for your advocacy in behalf of the marginalized, distressed, and underprivileged.” He also encouraged the awardees to “become our emissaries abroad”. PAFIOO is a biennial search for individuals and organizations based abroad who have dedicated their work in the service of Filipinos. This year’s Presidential awardees come from 12 countries and territories and had gone through a 4-stage selection process involving multi-sectoral representation. The Awards have four categories – Banaag, Pamana ng Pilipino, Lingkod sa Kapwa Pilipino (LINKAPIL), and Kaanib ng Bayan. The Banaag Award is conferred on Filipino individuals or organizations for their contributions that have significantly benefited or advanced the cause of overseas Filipino communities. The Banaag awardees are Corazon A. Francisco (Australia), Agnes Katbeth O. Kreimer (Peru), Dindo B. Malanyaon (Italy), Juliet Montano (Taiwan), Pilipino Workers Center of Southern California (United States), Maria Cristina F. Sulaik (Sudan), and Wimler Foundation Hong Kong, Ltd. (Hong Kong). The Pamana ng Pilipino Award is conferred on Filipino overseas, who, in exemplifying the talent and industry of the Filipino, have brought the country honor and recognition through excellence and distinction in the pursuit of their work or profession. 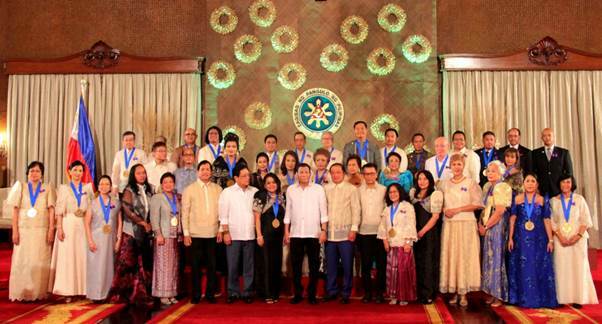 The Pamana ng Pilipino awardees are Paul C. Balan (United States), Edward M. Brotonel (United States), Nicolas M. Caraquel (United States), Elizabeth L. Engle (United States), Maria Theresa A. Eviota (Switzerland), Pedro A. Jose (United States), Teresita A. Marques (Portugal), C. Joe Sayas, Jr. (United States), Jose Dennis C. Teodosio (Myanmar), Saturnino H. Tiamson, Jr. (Hong Kong), Jhett D. Tolentino (United States). The LINKAPIL Award is conferred on Filipino individuals or organizations for exceptional or significant contributions to the reconstruction, progress and development of the Philippines. The LINKAPIL awardees are Association of Fil-Am Teachers of America, Inc. (United States), Salvacion G. Cimanez (Netherlands), Filipino-American Law Enforcement Officers Association (United States), Friends Indeed U.S.A., Inc. (United States), and Hilda L. Gigioli (United States). The Kaanib ng Bayan Award is conferred to foreign individuals or organizations for their exceptional or significant contribution to Philippine reconstruction, progress and development, or have significantly benefited a sector or community in the Philippines, or advanced the cause of overseas Filipino communities. The Kaanib ng Bayan awardees are Foreign Domestic Worker Association for Social Support and Training (Singapore), and Stichting LOOP (Netherlands). After the conferment of PAFIOO, the President also awarded the OFWs with Overseas Workers Welfare Administration (OWWA) 2018 MOFYA. MOFYA is given to promote success stories of OFWs amid the challenges of overseas employment and to highlight the role of OFW families as units in achieving socio-civic, education and professional success. The 2018 MOFYA awardees are engineer Mohammad Ali Sulay Urao and family (outstanding achievement in community projects); engineer Arnulfo Navarro Geganto and family (in entrepreneurship); Josefina dela Chica Villamor and family (Model OFW Family of the Year: land-based); and Domingo Cuanang Jr. and family, Reynaldo Granada Gaitan and family, and Gemelito Geloca and family (sea-based OFW family). The event was hosted by CFO Usec. Astravel Pimentel-Naik and OWWA Deputy Administrator Arnell Ignacio.